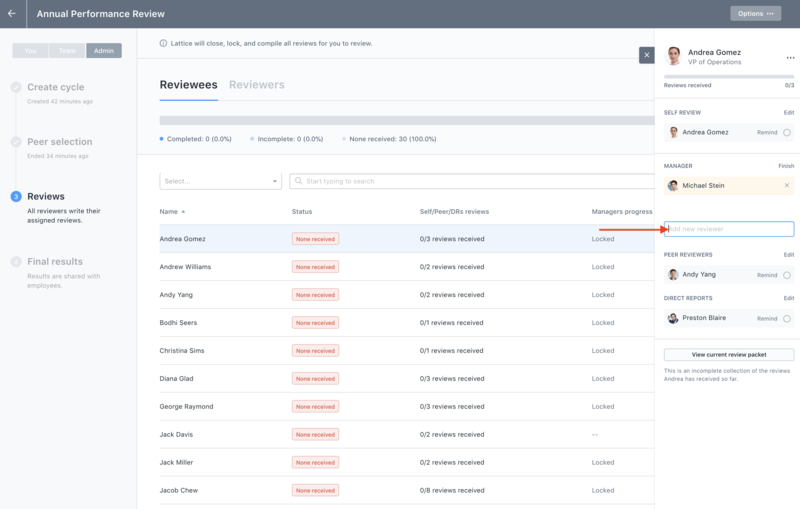 There is the ability to add an additional Manager Reviewer during a review cycle once the Peer Nomination process has ended. Once Peer Nomination has ended, navigate to the "Admin" Panel found in the top navigation bar, and click on "Reviews" found on the left Administration Panel. Once you have found the review cycle in question, click on "Manage cycle." Find the name of the individual you'd like to add the Manager Review for. On the right-hand side you will see a list of reviewers. In the "Manager Reviewer" section, click "Edit." This will give you the option to add another name, as shown below. Type in the name of the additional Manager and they will be added to that portion of the review. Note: adding this additional Manager Reviewer will not give them the same visibility as the individual's direct Manager. They will not have access into the private feedback or peer reviews of the individual they are reviewing. Only the individual's direct Manager will ever have access to that information during the review cycle. The additional Manager will have access to all public feedback and goals and will fill out the Manager template. To change an individual's Manager during the review cycle, please see here.